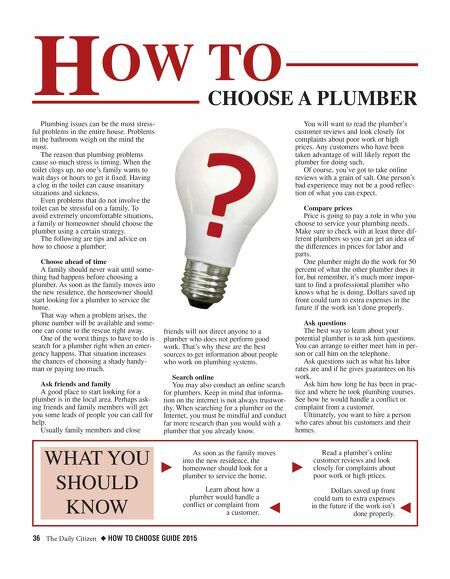 36 The Daily Citizen ◆ HOW TO CHOOSE GUIDE 2015 Plumbing issues can be the most stress- ful problems in the entire house. Problems in the bathroom weigh on the mind the most. The reason that plumbing problems cause so much stress is timing. When the toilet clogs up, no one's family wants to wait days or hours to get it fixed. Having a clog in the toilet can cause insanitary situations and sickness. Even problems that do not involve the toilet can be stressful on a family. To avoid extremely uncomfortable situations, a family or homeowner should choose the plumber using a certain strategy. The following are tips and advice on how to choose a plumber: Choose ahead of time A family should never wait until some- thing bad happens before choosing a plumber. As soon as the family moves into the new residence, the homeowner should start looking for a plumber to service the home. That way when a problem arises, the phone number will be available and some- one can come to the rescue right away. One of the worst things to have to do is search for a plumber right when an emer- gency happens. That situation increases the chances of choosing a shady handy- man or paying too much. 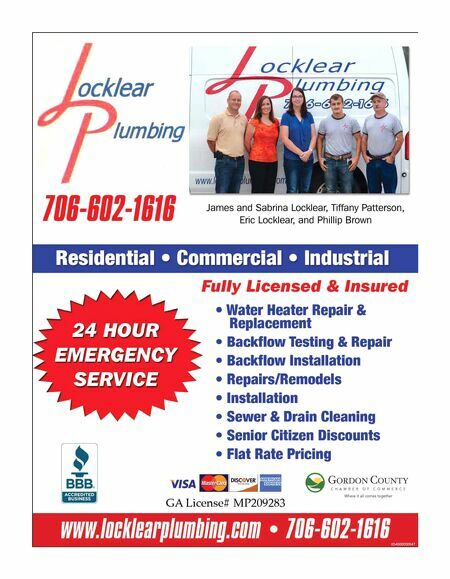 Ask friends and family A good place to start looking for a plumber is in the local area. Perhaps ask- ing friends and family members will get you some leads of people you can call for help. Usually family members and close friends will not direct anyone to a plumber who does not perform good work. That's why these are the best sources to get information about people who work on plumbing systems. Search online You may also conduct an online search for plumbers. Keep in mind that informa- tion on the internet is not always trustwor- thy. When searching for a plumber on the Internet, you must be mindful and conduct far more research than you would with a plumber that you already know. You will want to read the plumber's customer reviews and look closely for complaints about poor work or high prices. Any customers who have been taken advantage of will likely report the plumber for doing such. Of course, you've got to take online reviews with a grain of salt. One person's bad experience may not be a good reflec- tion of what you can expect. Compare prices Price is going to pay a role in who you choose to service your plumbing needs. Make sure to check with at least three dif- ferent plumbers so you can get an idea of the differences in prices for labor and parts. One plumber might do the work for 50 percent of what the other plumber does it for, but remember, it's much more impor- tant to find a professional plumber who knows what he is doing. Dollars saved up front could turn to extra expenses in the future if the work isn't done properly. Ask questions The best way to learn about your potential plumber is to ask him questions. You can arrange to either meet him in per- son or call him on the telephone. Ask questions such as what his labor rates are and if he gives guarantees on his work. Ask him how long he has been in prac- tice and where he took plumbing courses. See how he would handle a conflict or complaint from a customer. Ultimately, you want to hire a person who cares about his customers and their homes. H OW TO CHOOSE A PLUMBER WHAT YOU SHOULD KNOW k j As soon as the family moves into the new residence, the homeowner should look for a plumber to service the home. Learn about how a plumber would handle a conflict or complaint from a customer. k j Read a plumber's online customer reviews and look closely for complaints about poor work or high prices. Dollars saved up front could turn to extra expenses in the future if the work isn't done properly.